Remove the rear parcel shelf finisher. Refer to INT-33, "Removal and Installation". Remove the seat belt retractor anchor bolt and the seat belt retractor. Always perform an inspection after repair to be sure the system is functioning within specifications. Refer to SB-5, "Inspection". Tighten the seat belt retractor bolts to specification. Refer to SB-11, "Exploded View - Seat Belt Retractor". Remove rear seat cushion assembly. Refer to SE-23, "Removal and Installation - Seat Cushion Assembly". Remove seat belt buckle anchor bolt and the seat belt buckle. Tighten the seat belt buckle anchor bolt to specification. 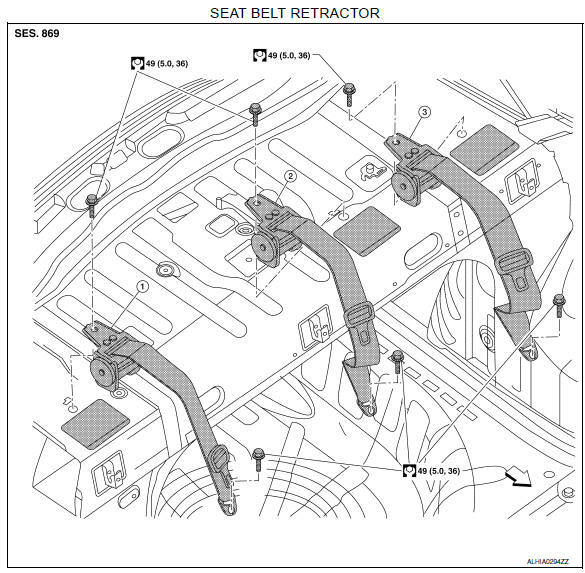 Refer to SB-11, "Exploded View - Seat Belt Retractor".